With this obligatory, “I am not a flake,” disclaimer out of the way, let me say how incredibly happy I was to discover the recently released Science Tarot set. That’s right, science-themed tarot cards, and they are absolutely delightful. All the traditional cards are here, but instead of wands, pentacles, swords, and cups, we have Bunsen burners, magnifying glasses, scalpels, and beakers. Filling the roles of king, queen, knight, and page in the various suits are science giants like Marie Curie, Charles Darwin, Hypatia, Galileo, Herschel, Oppenheimer, Barbara McClintok, Carl Sagan, John Muir, and others. 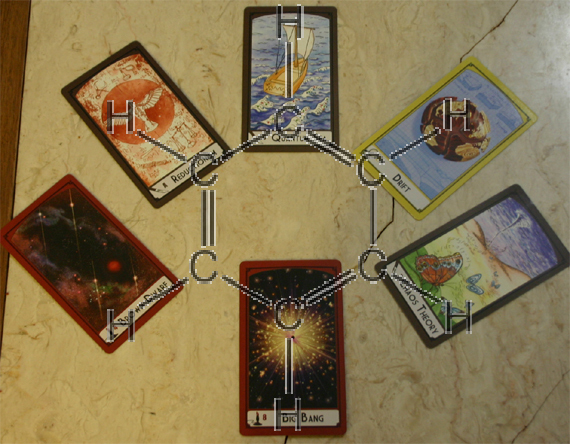 While the concepts surrounding science and academia fill in the major arcana, such as the student playing the Fool, Schrodinger’s Cat as the Wheel of Fortune, Conservation of Energy as Justice, and, most apropos, the Devil being unquestioning behavior. The cards tell a version of Joseph Campbell’s Hero’s Journey Monomyth adapted to the natural world, turning science into an epic hero’s quest, complete with discovery, strife, growth, and achievement. 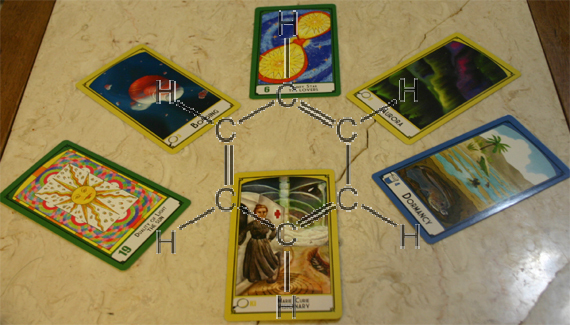 The set also introduces three new spreads for tarot readings: the Chemical Reaction, Periodic Table, and, my new favorite, the Benzene Ring. Product Representing the Future: Eight of Wands (Big Bang), the climactic birth of the Universe, sending ideas out into the public sphere, a growing universe of ideas and influence. With 10 cards, each one prompting the practitioner to focus on a different aspect of the question, this spread provides a great mental tool for deep immersion on a topic. 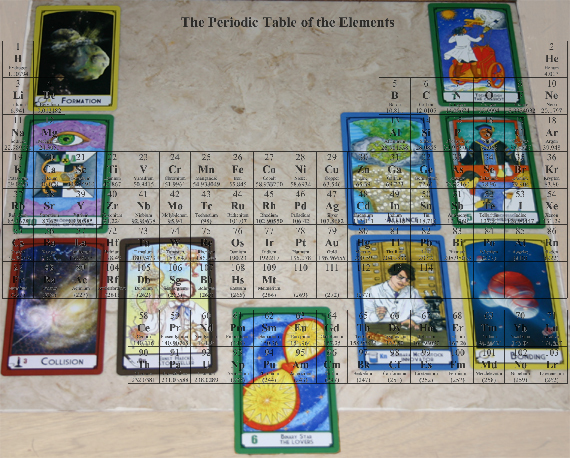 The positions of the cards relate to the elements on the periodic table in terms of being reactive, inert, transitory, and a place for the “undiscovered element.” I’ve found it a challenging spread at times, when a card appears in a position where I cannot find any connection to my own life, but everything up to that point had worked well, but the challenge itself provides deeper insights, even if it cannot be resolved. What do these two readings mean? They mean whatever you find in them for yourself. The book accompanying any tarot set is meant only as a starting point. From it, you can play with crafting your own spreads and semantic connections in the cards. My favorite aspect of Science Tarot is the familiarity of the people and concepts portrayed in the major and minor arcana. I know Carl Sagan far better than I know Odysseus, and will gain insights when he comes up in a reading from my personal experience with the Cosmos series and his many books. Lack of inquisitiveness speaks more to my personal philosophy than a supernatural lord of the underworld, just as the Conservation of Energy principle provides a more concrete concept than the sword and scales of Justice. I can lay these cards out and, based on what I know about the concepts, set the book down and make up my own interpretation of the spread. You can purchase a set of these cards on Amazon. They’ll make a great Winter Solstice gift for the scientists in your life. * My mother was very into New Age belief when I was growing up, and I was heavily exposed to the Association for Research and Enlightenment (A.R.E.) culture in Virginia Beach, and I can attest, the majority of psychics have the best intentions. They don’t know they are doing cold readings and making rainbow statements, they truly believe they have insights. A great article by a former psychic about how the culture creates these beliefs is Karla McLaren’s Bridging the Chasm between Two Cultures. Just as no one consciously designed the tarot to be universal, psychic culture didn’t set out to defraud people. I perceive them the same way I percieve psychiatrists: well-meaning, but no scientific support. “The tarot meme has survived five centuries, in part for the solace it provides, but also because it serves a useful function.” Here we have a misleading statement! People are being misled into believing that tarot cards have always been used for cartomancy. Tarot cards have survived for about five centuries but the OCCULT TAROT meme is little over 200 years old. When tarot cards first appeared in northern Italy they were used for a type of card game still played in some European countries and we have no evidence of any tarot card reading from before the 18th century. People in the media who promote the occult myth of tarot cards are doing damage to attempts to teach tarot card games to people in countries like the US. For this reason, the occult tarot myth is damaging to education and culture. I find the Science Tarot deck to be beautiful but I find the concept to be hypocritical. The promoters of this deck aren’t telling people of the original game playing purpose of tarot and are instead exploiting the occult tarot myth for the purpose of science education.